I was just wondering, is there a septa and/or njt rail museum? If not, would making one be possible? StrasburgRailroadFan wrote: I was just wondering, is there a septa and/or njt rail museum? If not, would making one be possible? Closest would be the PCC on display at 1234 Market, basement level. There are some Reading Blueliners in the area, including West Chester and New Hope & Ivyland. For vintage NJT equipment, URHS would be the closest. Their shop is open once a year in September. Electric City in Scranton has some classic P&W/Red Arrow equipment, also the ELDCPS in Scranton also has some EL/NJT Comet I coaches (restored to original EL numbers) as excursions. If you are willing to travel a little farther, Rockhiil Trolley Museum in Rockhiil Furnace, PA has the only operable P&W Bullet car, as well as P&W Strafford car #162 & one of the Liberty Liners. Pennsylvania Trolley Museum in Washington, PA has several pieces of both Red Arrow & PTC equipment, including a Market-Frankford Budd car. I've visited Electric City three times and can definitely vouch for the collection and presentation (although I really wish they'd move Bullet 206 out of the elements!) 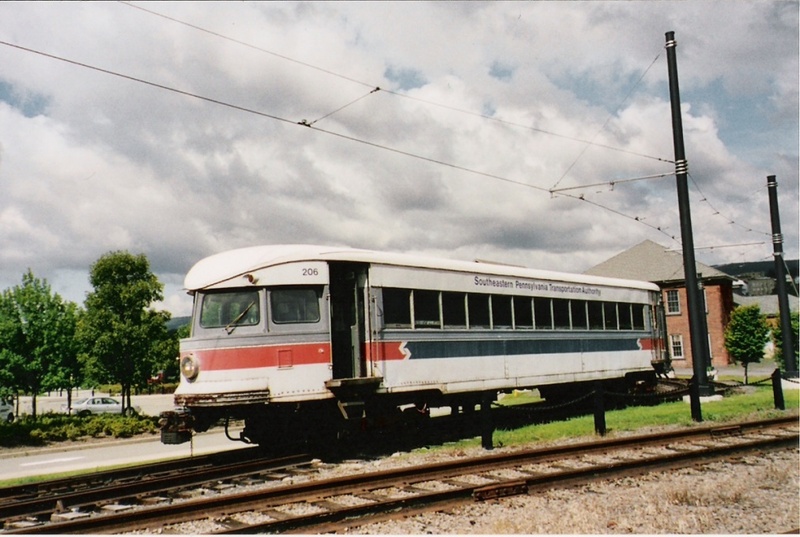 In addition to its tourist runs, Red Arrow center door car 76 actually operates in traditional revenue service to carry fans from Scranton's downtown to the local minor-league b-ball stadium. That said, my native cynicism says the likelihood is less than epsilon that SEPTA would do anything serious about helping a museum. SEPTA's had an obscenely poor "track" record when it comes to preserving equipment, e.g. letting dozens of PCCs rot under I-95 and in one case actually torching a car even though they knew a preservation group's flatbed was on its way only a few miles from the yard. If by "dozens of PCCs rot under I-95" you mean the trolleys at Front and Laurel St, and I know of no other trolleys that were under I-95, that was less than 2 dozen, and only a couple were PCCs, and it was part of Penn's Landing Trolley-Buckingham Valley Trolley Association's collection, Electric City's ancestor, that handled them. I was a proud member of BVTA, but SEPTA had certainly passed responsibility for storing those cars to us, and we did the best we could with very limited resources and no support from the city. That lack of support is a major reason why we moved the collection to Scranton. Hi Patrick, The sad collection I saw was definitely a large group of PCCs. IIRC there were news reports at the time re vandalism and weather damage so I’ll see if I can find anything archived somewhere. Back in the 80s there were also cars stored on one of the Delaware River piers. Would you have any additional info on what became of them? 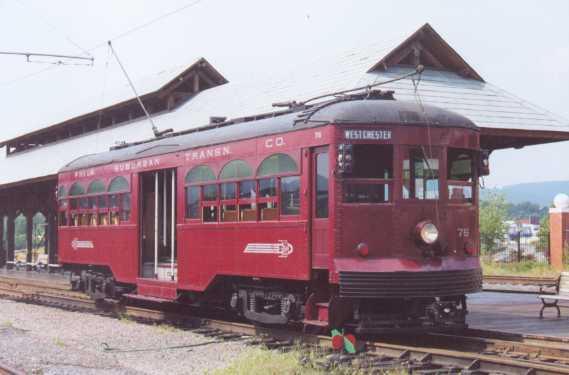 You will probably want to start off with the trolley museums around PA as other's mentioned. I have been to the Electric City trolley museum a few times and I loved it. Much of the old trolleys come from Philadelphia. If you can make it out there during the warmer months, ride the trolley excursion. It really gives you a feel of a true interurban. It's scenic and you end up near the minor league baseball stadium. I have never been to Rockhill or the PA trolley museum. I will most likely be in Pittsburgh either late spring or early summer and I plan to visit the PA trolley museum. As for NJT, the URHS facility in Boonton is great but they don't open it very much. NJT still runs plenty of museum pieces of equipment in revenue service and for a true railfan, that is a reason to like railfanning them. Once the Atlantic City Rail Line opens up for revenue service, you might luck out a lot with getting a GP40PH-2 leading a train. The majority of the GP40 units work the NJT trains that go out of Hoboken Terminal serving stations on the former Erie and Lackawanna Lines. On the NEC, Arrow IIIs do show up but often, they are on the Jersey Ave expresses which run during the week. The Arrow IIIs years are starting to get numbered. In four or five more years, they are going to be replaced by Multilevel MUs. Getting back to Septa, the oldest operating equipment are the Silverliner IVs and they are sill the bread and butter of Septa's RRD Lines. The year clock is starting to tick for them too. Just like NJT, Septa will be ordering Multilevel MUs. JeffK wrote: Hi Patrick, The sad collection I saw was definitely a large group of PCCs. IIRC there were news reports at the time re vandalism and weather damage so I’ll see if I can find anything archived somewhere. Where was this sad collection of PCC's under i-95 that you say you saw? I think you must be misremembering a different location. The only trolleys under i-95 were the Front and Laurel ones I mentioned. The cars stored on one of the Delaware River piers also were Penn's Landing Trolley's. First at pier 5, which had 2 tracks. When pier 5 got converted to condominiums we moved our operating fleet to pier 9, which had only 1 track. The rest of the fleet went to pier 38, then to Front and Laurel, then either to scrap after years of vandalism, or to Scranton. Patrick Boylan wrote: I think you must be misremembering a different location. Are those still running? They would be awesome during sports events. Interesting to reflect that the Philadelphia PCCs were released by SEPTA as being beyond economic repair. Brookville did a marvelous job, and they're working on more PCCs, from various sources, right now.